children's book illustration for awhile. inspire me to build up my portfolio. Your illustrations are top notch. You have that Disney style touch to your work which I find amazing. Great website as well. this is excellent! You could do any medium or texture and it would be great because the basic drawing skills are there and are strong. Plus, you must have used reference for these creatures, no? Great work! 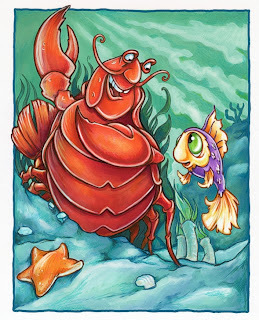 That is one jolly crustacean! Wow, this is really cool I like it a lot. great work. It is amazing how one little word can invoke so many ideas. I doodled until I got one I liked.